On Sunday night my wife and I decided to go see a free outdoor film at Hacienda La Vega in the far Southwest of Caracas. Trying to navigate the rather sharp, 90-degree turn from Av. O’Higgins into the driveway, something snapped and my small SUV made a terrible grinding sound. It was not a big surprise. For months our vehicle has been making a terrible popping sound whenever we turn sharply; especially when we back it up. For several weeks I called an auto-repair shop that had been recommended to me. But the head mechanic never had space for it. In this context “space” does not refer to a time slot on his agenda, but actual floor space in the shop. Most auto-repair shops in Venezuela are filled with cars that cannot be fixed because there are no replacement parts, and only have a space or two to actively work on cars. They didn’t charge me anything but didn’t call back either. I could get parts on Ebay and bring them back with me from the US. But experience tells me that I need to know exactly what parts to buy before bringing them. I am still sitting on a $900 air conditioner that I bought 2 years ago but was the wrong model. So we have been driving it only when it is raining or we are going to a place it is hard to get a taxi. Never having been to Hacienda La Vega, and the area being a little sketchy after dark, we thought it would be a good idea to drive. Fortunately, it broke down on a side road to Av. O’Higgins and was not in the way of traffic. I left the hazard lights on. We dashed across the street to a McDonalds and started to make phone calls. At one point a jeep with five military men stopped and checked out our vehicle and made some notes. We watched from a distance, preferring that they tow it over talking to them and risking they ask for a bribe or worse. McDonalds was doing a surprisingly brisk business. With most of their value meals costing around Bs. 2000—approximately 2 days’ pay at minimum wage—I was surprised at how many customers they had on a Sunday night. After approximately 2 hours we finally got a tow truck to take us and our vehicle home and positioned it in its parking space. In our small building about one third of the cars are broken down, unfixable because of the lack of replacement parts. This morning as we have for the past couple of months, we sent my daughter to school with our local taxi company. My wife and I also had appointments and needed to take taxis, but did not have enough cash on hand. We went to the closest shopping mall at 9 AM. But due to the new electricity restrictions, it does not open until noon, meaning we could not get to our bank. We tried the ATMs outside of the mall, but the lack of people around them was a bad sign, and indeed they were empty. We went to another bank which had a Bs. 600 (60 cents at the parallel rate) maximum withdrawal. After five withdrawals and being rejected for a sixth we had Bs. 3000 ($3 at the parallel rate) in hand and were ready to go. If we had been able to go to an ATM of our own bank it would have been better because we could have withdrawn a maximum of Bs. 9,000 ($9). To reduce expenditures of our precious cash, my wife and I shared a taxi which cost Bs. 800 (80 cents). She was headed to the UCV and I would get off in Bello Monte to go to the dentist. I’ve had a great dentist for the past ten years who is very competent, uses the latest technology and materials, and charges reasonably. She is also a typical Venezuelan professional and likes to chat as she works. When I asked her how things were going with her practice she said she was glad to be working, but that she had to buy all of her materials at the parallel rate. She said all of the major dental supply wholesalers had closed and that their best sales representatives had started to work on their own, importing dental supplies at the parallel rate. This was an uncomfortable position because while she was able to obtain materials, some long-time clients simply could not pay for the work they needed. After my teeth cleaning I went across the street to a bakery to have a marrón oscuro grande (basically a cappuccino) which cost me Bs. 350. Then I realized that the Bs. 750 I had left probably would not be enough to take a taxi home so I decide to walk. Walking up the Av. Rio de Janeiro I came upon Ferretotal, a Home Depot-like chain hardware store on Av. Rio de Janeiro. It had some bare shelves but was stocked rather well. There were few clients, though, and the prices were high—Bs. 35,000 ($35 at the parallel rate) for a relatively small book-shelf, for example. I continued on and came upon Daka. This is the store that was at the center of the November 2013 policy of forced price reductions that gave Chavismo a big enough boost to win the December 2013 municipal elections by 10 points. Today their lage showroom had only three products. They had an Oster hair dryer for Bs. 19 mil ($19), a 12,000 BTU air conditioner for Bs. 198 mil ($198), and a boom box for Bs. 148 mil ($148). They probably had a couple of hundred hair dryers, 50 A/C units and 20 boom boxes. I was going to take a picture but the security guard said it was prohibited. I continued on, choosing to walk down Av. Paris towards Chuao, passing by the Excelsior Gama-Express (a smaller version of the standard Excelsior Gama supermarkets). When I got close I saw no lines, which suggested to me that they did not have any price-controlled goods. However, when I entered the store it was packed to the gills. All five cash registers were operating and had lines of approximately 30 people. Each line extended to the back of the store. There was literally no way to peruse the aisles of the store since they were packed with people. I only managed to walk the circumference of the floor plan and exit. On my way out I asked what they had today and a young man answered “margarine, Ariel (laundry detergent), and toilet paper” with a tone of opportunity. Most of the people in these lines are not simply doing their daily shopping. They are what Venezuelans call bachaqueros—after the carpenter ants that carry loads many times their own weight—and this is their job. They wait in line for hours, buy whatever price regulated products they can—usually for pennies or dimes—and resell them to a middle man. The latter resells them to a retailer who sells them in a street market or delivers them directly to a consumer’s house. Doing so they can make many multiples of the minimum wage. Indeed, while the Maduro government has referred to these bachaqueros as traitors and conspirators, the economic relief this activity provides to the unemployed and underemployed is probably what has prevented a social explosion from occurring. My family and I actually do not wait in these lines, nor do we buy from bachaqueros. Since I travel abroad frequently, I bring back suitcases full of everything from Acetominophen, to printer cartridges, to dish soap, to whole grain pasta, to canola oil, to toilet paper. We keep our surplus locked in our bedroom, so as not to tempt anyone who might work in our apartment. I spent the afternoon working in my home office. My wife came home in a taxi. Then my daughter came home in a taxi. We had to scrounge up our last Bs. from all of our wallets and backpacks and pants pockets to get together Bs. 800 (80 cents) to pay my daughter’s taxi fare. For dinner my wife and I walked a couple of blocks to an upscale Italian restaurant. 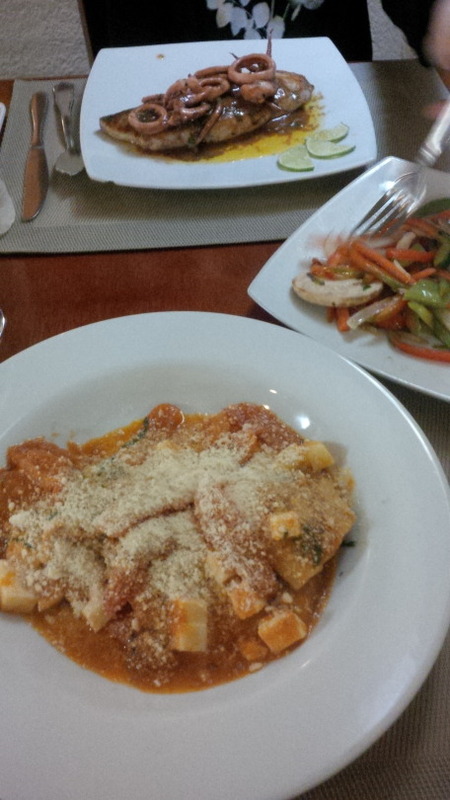 Lamb ravioli al filetto, a swordfish steak in seafood sauce, a salad to share and two glasses of wine came to Bs. 23 mil ($23). We were able to pay with our ATM card, otherwise it would have required a small duffle bag of cash to pay for it. For those who have enough money and are in good health, daily life in Caracas has become and endless series of uninteresting challenges interspersed with dirt-cheap delights. Stresses can be compensated for by the opportunities inevtiably afforded by economic distortions. But for the poor who depend on price-controlled goods and the sick who cannot obtain medicines it has become an endless series of cruel challenges interspersed with harsh realities. Opportunities for extra income through bachaqueo are confronted by the fact that it is next to impossible to really obtain the variety of price-controlled goods required by a household. And people with chronic illnesses can only wait for the moment when “no hay” takes its toll.